Lauren is our Practice Manager. She came to the Weare Animal Hospital in August of 2007 when she and her family relocated to New Hampshire from Connecticut. She received a Bachelor’s degree in Animal Science from Becker College in Massachusetts and is a Certified Veterinary Technician. She lives in Hillsboro with her husband, son, black Labrador Flynn and Julius the Gecko. 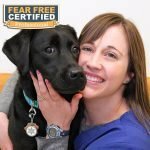 Lauren has a very strong interest in veterinary dentistry, focusing on the prevention of disease and educating clients at all stages of periodontal disease. She assures that each patient receives the highest level and quality of care at the Weare Animal Hospital. Lauren enjoys baking, running, grilling and spending time outdoors with her family.